Customizable tabs allow you to organize your charts to meet the needs of your specialty and your office. Some examples include "Consents", "Laser", "Breast Surgeries". Templates for each chart are then assigned to the appropriate page. Our template designer is so flexible that not only will it meet your medical charting needs but we here at Mack Software use if to chart our sales, customer training and technical support calls. 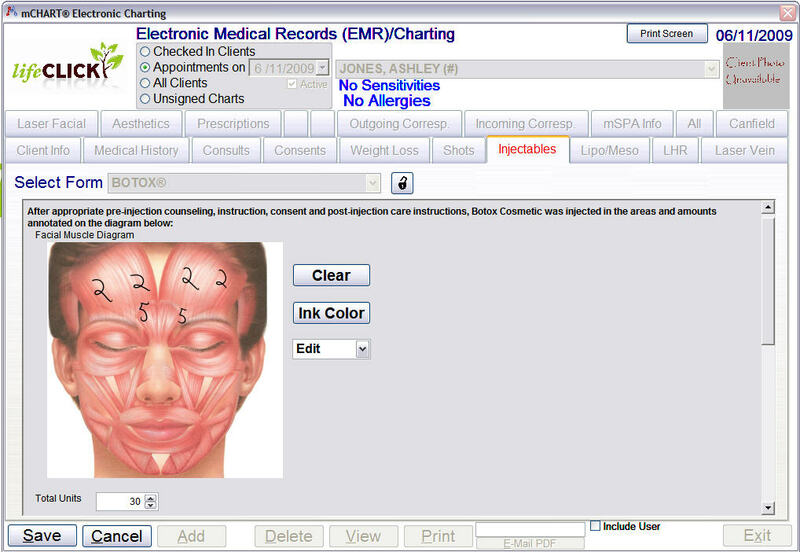 What other software company uses their own EMR software to meet their charting needs? Our electronic charting module links with your mSPA® and mDOC database to provide you with quick access to client/patient information. No more pulling charts every day. Our customers who no longer use paper charts have found electronic charting to be simpler, less time consuming, and money saving! For more information on going green, please read the article Go Paperless the Easy Way.